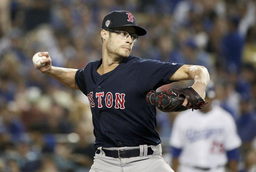 LOS ANGELES (AP) Joe Kelly helped the Boston Red Sox win a World Series title. His next goal is to try to win one for the team he grew up rooting for and defeated this October. The Dodgers on Friday officially announced signing Kelly to a three-year deal worth $25 million that brings the 30-year old right-hander back to Southern California. Kelly was born in Anaheim and grew up in Corona, where most of his family still resides. "It is one of those things where I am at a point in my career where I have tons of family that is local. I also wanted to be on a team that wins year in and year out," Kelly said during a conference call. Kelly leaves Boston, who acquired him from St. Louis in July 2014. He is expected to be a setup man for closer Kenley Jansen, who is still recovering from an offseason heart procedure. Kelly gets a $1 million signing bonus and salaries of $3 million next year and $8.5 million in each of the following two seasons. The Dodgers have a $12 million team option for 2022 with a $4 million buyout. He could earn $2 million annually in performance bonuses for games finished: $250,000 each for 30, 35, 40, 45, 50 and 55, and $500,000 for 60. Upgrading setup and middle relief was one of the Dodgers' priorities during the offseason. "The reliever market has been interesting to see. For teams that are championship-caliber, that's a big role and it doesn't get magnified until the playoffs," Kelly said. "Without a good bullpen it is very hard to win a World Series." Kelly made the fourth-most appearances in the American League last season (73) and was 4-2 with a 4.39 ERA and two saves. His numbers improved greatly during the postseason as he allowed just one earned run in 11 1/3 innings with 13 strikeouts and no walks. In the World Series, Kelly appeared in all five games and did not allow a run, striking out 10 in six innings. According to Brooks Baseball, Kelly's fastball averaged 98.7 mph this season, but he also used his changeup more and developed a slurve after deciding to shelve his slider and curveball. Kelly said mechanically he changed some stuff with his arm slot in order to deliver the ball quicker. Besides the World Series, Kelly has been a bit of a nemesis for the Dodgers. He broke Hanley Ramirez's rib when he hit him with a pitch in the 2013 NL Championship Series opener. Kelly said the pitch got away from him and that both of them talked it out when Ramirez joined the Red Sox in 2015. Kelly hit the New York Yankees' Tyler Austin on the back with a pitch April 11, four innings after Austin spiked Red Sox shortstop Brock Holt when he slid into second base with a high right foot. That set off a brawl and Kelly was suspended for six games. Andrew Friedman, the Dodgers' president of baseball operations, said he likes Kelly's ability to provide more than one inning out of the bullpen and that he could be used in a variety of situations.